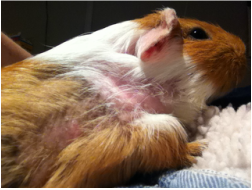 Do you think you would like to foster guinea pigs? The opportunity could bring to you many new experiences you may otherwise never get to enjoy. The most common reason for surrender involves two mis-sexed guinea pigs the owner purchased from a pet store. People kindly bring them to us because they are overwhelmed or want help. The females are often pregnant. Being rodents, they tend to multiply quickly. Breeding can be dangerous to females. 1 out of 5 females will die during birth or from birthing complications. Because of this, you may believe you will never get the chance to see baby pigs be born. As a foster, you will! As long as you have the knowledge, willingness to learn, and a good vet nearby, you just might get the opportunity! I won't lie. Sometimes the guinea pigs come in from horrible situations. This guy just needed good nutrition and a place to run for a while. Clue grew back all of his hair and went on to his new forever home, in time. He lost hair because he was fed raw rotten potatoes and was kept in a small tub (14x20 inches) with nine other pigs. Rest, space, good nutrition and time were all this guy needed. These pigs often make fostering extremely easy! They love your attention and treats so much. Their depth of affection, their understanding of how much you love them and their appreciation of your attention make your job enjoyable. - An application for fostering. - Food, Hay and Fresh Veggies. ​- Appropriate bedding. Carefresh, aspen shavings, or fleece or towel cage liners are acceptable. Cedar or pine shavings are harmful and should never be used as bedding for guinea pigs. - Appropriate housing. If I have a cage, I will be happy to lend it to you. But that is dependent upon what I happen to have at the moment. Expenses for medical treatment are covered by HALT North. A good cavy-savvy local veterinarian is an important piece of the fostering puzzle. Please know, HALT needs you as a foster home. We will do everything we can to make your fostering opportunity fun and affordable. We are a very small organization. Having the foster home provide food, fresh veggies, hay and bedding helps keep overhead expenses to a minimum. This, in turn, ensures that piggies needing medical attention, whether emergency or long term, will get the veterinary support they need. Are You Still Excited About This? Georgia is! She's so excited you want to give someone like her a temporary home!!! Go to our online form to fill out the Foster Application online. This doubles as the Adoption form. You just need to click "foster" to indicate you wish to become a foster home. It's so easy!